Many people believe that the main symptom of heart attack is when the individual clutches at her/his heart dramatically with severe chest pain. In fact, this is not true. 25% of the heart attacks occur silently, without any clear symptom or sign. Dr. C. Crandall is a cardiologist who dedicated many years of his career in order to minimize, prevent and reverse heart disease. According to him, our heart actually gives us a sign of a potential heart attack before it happens. 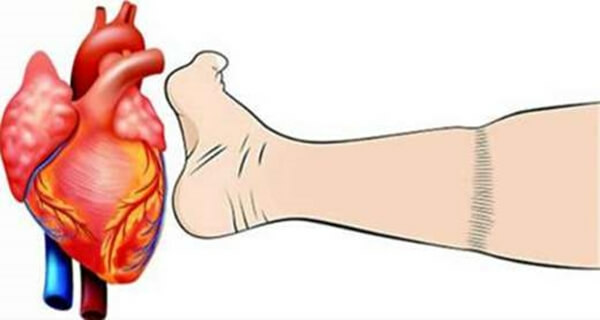 A lot of people believe that swelling of the ankles or feet is related to excessive standing or sitting without knowing that heart failure can lead to accumulated fluid in the body. It can cause swelling the ankles, feet, legs, or abdomen. Many people can retain so much fluid and experience sudden weigh gain. When this occurs, the individual can lose the appetite. People that have heart attack state that they had experienced anxiety attacks immediately before the heart attack happened. Even though some people with anxiety attack consider that they are having heart attack, it is better to prevent than cure. The pain starts in the chest and spreads to the jaw, shoulder, arms, back, and abdomen. In some cases, people do not experience chest pain, but pain in some other parts of the body. Mostly, the pain occurs in one of both arms or between the shoulder blades. There are some cases when the victims cough bloody phlegm or have wheezing or nagging cough. This can indicate a heart failure and it is because of fluid accumulation in the lungs. Make sure to pay particular attention to this symptom! It is very important not to ignore the symptoms hoping that they will go away. In a case they last for more than 5 minutes, make sure to call 911 or go to the hospital immediately. Taking an aspirin is also a helpful alternative, except for those who are allergic to it.